This beautiful holiday home will seduce you at first sight! 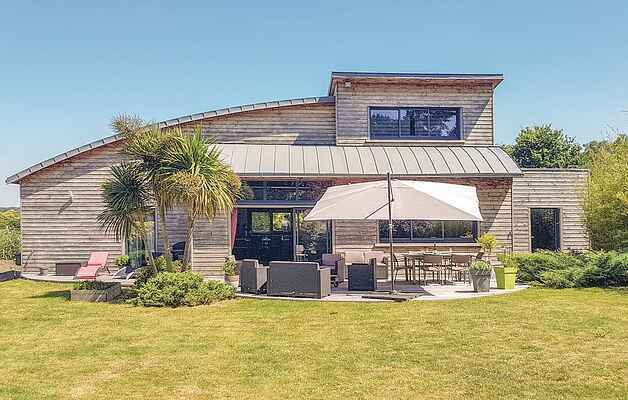 Located in Moëlan-sur-Mer, 5.7km from the beaches and 13km from Quimperlé, this wooden house with contemporary architecture offers a bright and comfortable interior and will be ideal for holidays with family or friends in Finistère. To enjoy the sun, a beautiful wooden terrace of 48m² awaits you and you will love the large garden of 1300m². Bedroom # 1 is very large and has a private bathroom. 1500m away, one of the most beautiful ports of Brittany awaits you. 5.7 km away, the beach of Kérou welcomes you for beautiful sunny days and water sports enthusiasts will find their happiness. In the surroundings you will make discoveries and exciting visits, starting with Quimperlé and its abbey of Sainte Croix (13 km). Pont-Aven and its historic center will charm you just as much 16 km), as Quimper and its beautiful streets lined with half-timbered houses (52 km). Want to remain fit or just relax? Golf, horse riding or leisurely bike rides, you will find your happiness! In Pont-Scorff, the Zoo and the aquarium (23km) will delight young and old and you will spend a beautiful day at the Labyrinth of Pont-Aven. And for gourmands, creperies will be an essential step. Come and discover Finistère thanks to this beautiful vacation rental.